Seed&Spark is a purpose-driven company with a big mission: change the entertainment landscape to allow all creators to build sustainable careers, not just those who won the lottery in Hollywood. It originated as a crowdfunding platform in 2012, but was planning to grow into a streaming platform focused on featuring diverse, independent creators. The vision was to create thousands of sustainable filmmaking careers, a direct audience-to-creator community, and millions of subscribers. Seed&Spark had clear filmmaker-facing value, but we were getting into a new space. To make the kind of change we envision in media and entertainment, we would have to create a valuable, differentiated streaming service (an entirely new product) and find our audience (an entirely new user group). I decided to run a series of sprints following a human-centered design process: conducting primary and secondary research, framing the problem for a iterative sprint design, ideating based on our findings, and testing out ideas and assumptions through prototyping before build. I started by running a brand sprint to get down on paper what our long-term goals were as a team, and how we wanted to position ourselves. Seed&Spark, as a purpose-driven company, has incredible core values and ethics that guide our day to day decisions and business direction, and I wanted to make sure that continued to lead us as we shifted our focus towards audiences and content consumption, rather than production. I then moved on to series of research sprints. From past experimentation, marketing, and business development, we had a basic idea of who the company was already talking to (through the crowdfunding side), and who we thought would be most likely to sign up for a new streaming platform with our content. We started by doing further market research, but hit our big breakthroughs in doing ethnographic research with deep, qualitative user interviews. It turned out that diverse millennials (who we thought would be interested in fresh new series with diverse millennials) were likely to express interest in the concept of the product, but entirely unlikely to convert for a multitude of reasons. * We established personas and jobs to be done for user types who were open to new streaming platforms and movies & shows they hadn’t previously heard of. With our research in hand, it seemed like an opportunity to really innovate and solve some sticky problems: namely, the oversaturation of the content market and lack of insight and awareness into how media gets made (the FairTrade and ethical consumption parallel for entertainment). I decided to run few design sprints. We started by targeting our sprint questions: where were our biggest assumptions and risks? These allowed us to focus in on creating a meaningful quality threshold first and foremost. We then create our target customer map and honed in on the greatest areas of complexity and potential upside/downside. We decided to focus on creating a new homepage first, and a new library second. The team then put together a list of high level strategy questions – questions that would allow us to create a framework for innovation and experimentation without getting too far from our core goals.These were bucketed into themes like discovery, connection, inclusion, and curation, and we prioritized what to focus on first. Unclear value proposition, doesn’t address actual user need from audience perspective. Stuck in paradigm of leading with crowdfunding platform and attempts to glue together two separate marketplaces, which is highly confusing for the user. Human-centered design focuses on put the audience front and center, and provides value first by creating usefulness (address unmet need of diverse, quality stories through show not tell), then delight. We got our key stakeholders together for some days of dedicated ideation. We looked at analogous research, tested out some crazy ideas, had some earnest debates, and made our final votes for what to test now, and what to test later (and what to throw out and never speak of again). With our cross-functional team of stakeholders, we built a rough prototype with all of our core ideas to test in a day. We put our prototype in front of our target audience for both usability testing and gathering feedback on the key idea of the product: were we actually providing value? 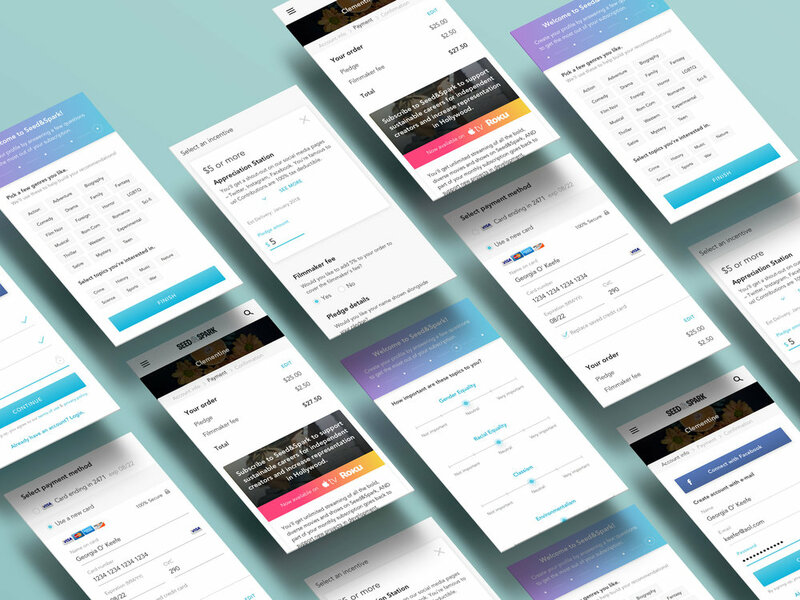 With 5 rounds of interviews, we learned an enormous amount about usability but, more critically, about the new concepts or suggested user behaviors that really resonated. 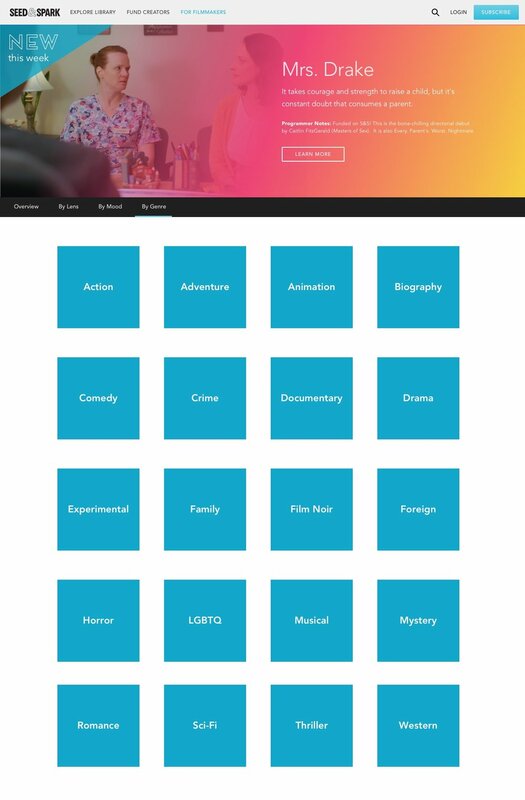 Ideas like a starter kit of films, recommendation quiz, samples, and curation through “theme” or “perspective” created user delight and changed perception of the brand and content library overall. We ran through further iterations and testing until we felt confident in our design solutions. I then took the project on through interface design and documentation, and worked with our programming, marketing, and dev teams to get to product launch. As Chief Design Officer of Seed&Spark, I also lead all other product and visual design, from filmmaker-facing tools through to marketing collateral. While we don't run design sprints constantly, we do practice human-centered design and design thinking at every level. All work is done mindfully at the intersection of user and business needs, and we place rapid learning at the heart of each new feature and touchpoint.